Rice, Oryza sativa L., is the staple food for half the world’s population. By 2030, the production of rice must increase by at least 25% in order to keep up with global population growth and demand. Accelerated genetic gains in rice improvement are needed to mitigate the effects of climate change and loss of arable land, as well as to ensure a stable global food supply. We resequenced a core collection of 3,000 rice accessions from 89 countries. All 3,000 genomes had an average sequencing depth of 14×, with average genome coverages and mapping rates of 94.0% and 92.5%, respectively. From our sequencing efforts, approximately 18.9 million single nucleotide polymorphisms (SNPs) in rice were discovered when aligned to the reference genome of the temperate japonica variety, Nipponbare. Phylogenetic analyses based on SNP data confirmed differentiation of the O. sativa gene pool into 5 varietal groups – indica, aus/boro, basmati/sadri, tropical japonica and temperate japonica. Here, we report an international resequencing effort of 3,000 rice genomes. This data serves as a foundation for large-scale discovery of novel alleles for important rice phenotypes using various bioinformatics and/or genetic approaches. It also serves to understand the genomic diversity within O. sativa at a higher level of detail. With the release of the sequencing data, the project calls for the global rice community to take advantage of this data as a foundation for establishing a global, public rice genetic/genomic database and information platform for advancing rice breeding technology for future rice improvement. For much of the world’s poor, rice (O. sativa L.) is the cereal that provides the majority of daily calories in their staple diet. Rice is also known for its tremendous within-species genetic diversity and varietal group differentiation [1, 2]. Rice productivity has more than doubled in recent decades, resulting primarily from the Green Revolution and continued breeding efforts since the 1960s. However, in order to meet the demands imposed by the projected increase in global population, the world’s rice production has to increase by 25% or more by 2030 . This increase has to be achieved under less land, less water and under more severe environmental stresses due to climate change. Thus, accelerated genetic gains are needed in the next few decades to improve yield potential and stability, and grain quality of rice. This requires more complete knowledge of the genetic diversity in the O. sativa gene pool, associations of diverse alleles with important rice traits, and systematic exploitation of this rich genetic diversity by integrating knowledge-based tools into rice improvement using innovative breeding strategies [4–6]. To date, a few studies on rice have been undertaken to discover allelic variants through next generation sequencing (NGS) [7–9]. Unfortunately, these studies have been unable to provide a complete picture of the total genetic diversity within the O. sativa gene pool, due to either the small sample size of sequenced accessions , or the low-coverage sequencing depth of the genomes [8, 9]. Here, we report an international effort to extend significantly our understanding of the total genetic diversity within the O. sativa gene pool by re-sequencing 3,000 O. sativa genomes using IIllumina-based NGS. Our ultimate goal is to establish, through collective efforts by the international scientific community, a public rice database containing genetic and genomic information suitable for advancing rice breeding technology. A total of 3,000 germplasm accessions were chosen for sequencing, including 2,466 accessions from the International Rice Genebank Collection (IRGC) at the International Rice Research Institute (IRRI), and 534 accessions from the China National Crop Gene Bank (CNCGB) in the Institute of Crop Sciences, Chinese Academy of Agricultural Sciences (CAAS). The 2,466 accessions (in Additional file 1: Table S1A ) contributed by IRRI represent a panel that was randomly selected from a core collection of 12,000 O. sativa accessions that was established by a semi-stratified selection scheme from more than 101,000 rice accessions in the IRGC; taking into account factors, such as the country of origin, eco-cultural type and varietal grouping with even coverage of the name space while limiting potential duplicates from each country, and complemented by specific, nominated entries from IRRI and the Centre de Coopération Internationale en Recherche Agronomique pour le Développement (Cirad). The 534 accessions (in Additional file 1: Table S1B) contributed by CAAS included a mini-core collection of 246 accessions selected from a core collection of 932 accessions established in the same way from the 61,470 O. sativa accessions preserved in the CNCGB , plus 288 accessions selected based on their isozyme diversity , and used as parental lines in the international rice molecular breeding network . 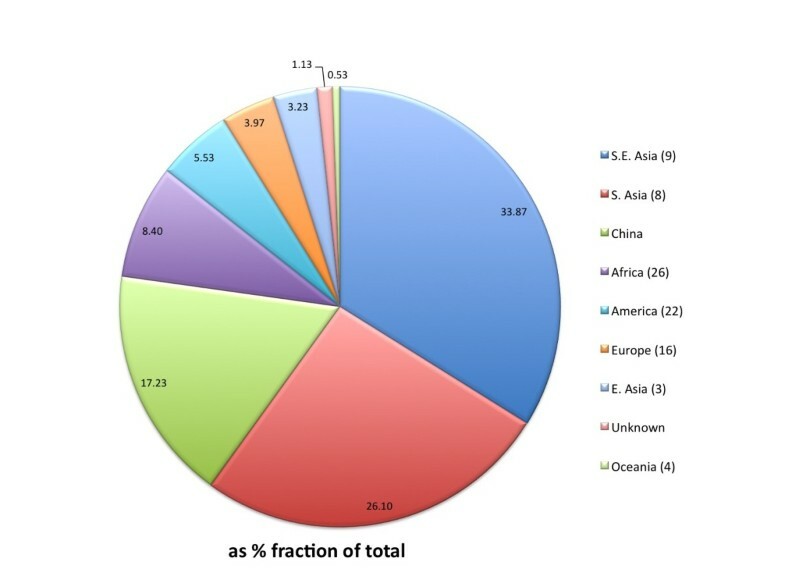 Together, the sampled 3,000 rice accessions came from 89 different countries/regions, 77.1% of which are from the centers of rice genetic diversity -Southeast Asia (33.9%), South Asia (25.6%) and China (17.6%) (Figure 1). Geographical distribution of the 3,000 sampled rice accessions from 89 countries (see Additional file 1 : Tables S1A and S1B). The numbers in the parentheses after each region are the numbers of the countries in the region. Genetic stocks derived from the O. sativa accessions were generated for each of the sampled 3,000 rice accessions by one or more cycles of single-seed descent purification under field or screen-house conditions. New accession numbers were assigned to seeds derived from one or more rounds of multiplication starting from a single plant of each source accession. As of March 2013, new accession numbers have been assigned to 1,958 of the IRRI accessions. Purified seeds of the sequenced accessions are (or will be available) from the IRGC or CNCGB as genetic stocks. Information on obtaining seeds from the IRGC can be found at  and from the CNCGB at . Genomic DNA was prepared from bulk harvested leaves of a single young plant for each sampled accession by a modified CTAB method either at IRRI or at CAAS. Genomic DNA samples were then shipped to BGI-Shenzhen and were used to construct Illumina index libraries following the manufacturer’s protocol. Following quality control, at least 3 μg genomic DNA of each sample was randomly fragmented by sonication and size-fractionated by electrophoresis, and DNA fragments of approximately 500 bp were purified. Purified 500 bp DNA fragments from each of the 24 accessions were labeled independently using distinct 6 bp nucleotide multiplex identifiers, followed by pooling prior to library construction for NGS. Each sequencing library was sequenced in six or more lanes on the HiSeq2000 platform and 90 bp paired-end reads were generated. Subsequently, the reads from each sample were extracted based on their unique nucleotide multiplex identifiers as 83 bp reads (90 – 6 – 1, where 1 is the ligation base “T”). To ensure high quality, raw data was filtered by deleting reads having adapter contamination or containing more than 50% low quality bases (quality value ≤ 5). recalibrating realignments using the BaseRecalibrator package in GATK. SNP and InDel calling for each sample were performed independently using the UnifiedGenotyper package in GATK with a minimum phred-scaled confidence threshold of 50, and a minimum phred-scaled confidence threshold for emitting variants at 10. To ensure the quality of variant calling, the conditions for every site in a genome were set at >20 for mapping quality, >50 for variant quality and >2 for the number of supporting reads for every base. SNP and InDel calling at the population level (i.e., for all sequenced genomes concurrently) was performed using the UnifiedGenotyper package in the GATK pipeline with 50 for the minimum phred-scaled confidence threshold for variant calling, 30 for the minimum phred-scaled confidence threshold for variant emitting, >20 for the mapping quality, MAF >0.001 for every SNP, and >2 sequence depth for genotypes in every sample. Five independent, randomly selected sets of 200,000 SNPs with minimum missing data were then selected for phylogenetic analysis. For each of these five sets, distance matrices using the p-distances model were calculated, and Neighbor Joining trees were constructed with 1,000 bootstraps using the TreeBeST software . Consensus trees were exported as Newick format and imported into DarWIN v5.0.158 for topology visualization . For each of the five consensus trees, prior information on variety group designation (based on SSR or isozyme classification) was used to define assignment to one of the five groups – indica, aus/boro, basmati/sadri, japonica (tropical or temperate). Groupings assigned for each of the five trees were compared using a majority rule criterion (i.e., a minimum of three trees to support the assignment). Those accessions that failed this test were labeled as intermediate types. Using IRGSP-1.0 as the reference, the 3,000 sequenced genomes had an average depth of ~14×, ranging from ~4× to greater than 60×, and yielded a combined total of approximately 17 TB of high quality sequence data. Of the 3,000 entries, 2,322 accessions had >10× sequence depths. When aligned with IRGSP-1.0 using the BWA software, the average genome coverage and mapping rate were 94.0% and 92.5%, respectively. BWA alignment followed by variant calling using GATK identified approximately 18.9 million single nucleotide polymorphisms (SNPs) (Table 1). The distribution of the identified SNPs across different chromosomes varies considerably, with chromosomes 4, 1 and 11 having the highest numbers of SNPs and chromosomes 9, 10 and 5 having the lowest. Most SNPs were detected in intergenic regions and introns, based on comparison with gene annotations provided by MSU v7 [13, 19]. Only 18.24% of the detected SNPs occur in exons, of which ~40% are synonymous. The MSU V7.0 rice gene annotation for 55,986 genes and 66,338 mRNA  as a raw gff3 file type was downloaded from the Rice Genome Project Annotation ftp site . Prior to categorization of SNP types, the raw gff3 file was processed 1) to remove all but the primary mRNA transcript and 2) to select the gene models with the highest support in cases where there are overlapping gene models. Hence, SNP characteristics are reported here for 55,107 of the 55,986 gene models. Characteristics of SNPs in pseudogenes or where the reference base is N (unknown or missing) are not reported. Syn = synonymous; Non-syn = non-synonymous. The phylogenetic analyses revealed clear differentiation of the 3,000 accessions into two major groups – indica and japonica, two small varietal groups – the aus/boro and basmati/sadri types, plus a small group (134) of intermediate (admixed) types (Figure 2). The indica group represented the largest and most diverse group comprising 1,760 (58.2%) accessions in five major subgroups of diverse origins. The japonica group contains 843 (27.9%) accessions, which had two well-differentiated subgroups – 388 temperate japonicas and 455 tropical japonicas. The aus/boro group is composed of 215 accessions and is more closely related to indica, while the aromatic basmati/sadri group is more closely related to japonica and consists of 68 accessions primarily from South Asia. Classification of 3,000 rice accessions into five distinct varietal groups based on 5 sets of 200,000 random sets from the 18.9 million discovered SNP variants. The sequencing data of the 3,000 rice genomes project (3K RGP) is now deposited in the GigaScience database (GigaDB) and has a citable digital object identifier (DOI) . The dataset consists of separate directories for sequences from each of the 3,000 rice genomes. These directories are named by the DNA_UNIQUE_IDs given in Additional file 1: Tables S1A and S1B. If the DNA_UNIQUE_ID contains a space, the space is replaced by an underscore. Each directory contains from 12 to 40 Fastq (fq) files of trimmed, filtered reads that are compressed using GNU zip (gzip, .gz). The dataset consists of about 15.4 terabytes (Tb) of files. Individual data files can be downloaded using tools such as File Transfer Protocol (FTP). In order to obtain the complete dataset, use of FTP is not possible due to the time required for file transfer and bandwidth consumed; other tools will be needed. After download or acquiring, depending on the task, from 8 Gb (reference-guided alignment and variant calling) to 16 Gb (de novo genome assembly) or more main memory is needed and from 16 to 64 Gb or more swap space allocated for each pipeline; computation will require from 7 hours (alignment and calling) to 3 days (assembly) per core per pipeline. 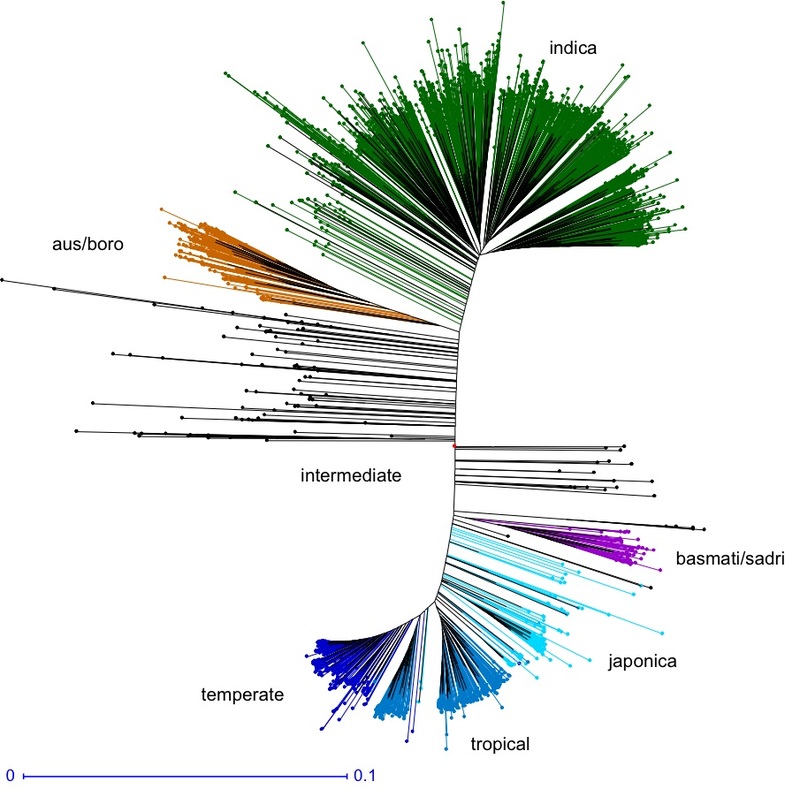 This 3,000 rice genomes dataset provides an unprecedented resource for rice genomic research. With access to the genome sequences of the 3,000 accessions representing various varietal types of diverse origins and availability of additional high-quality rice reference genomes, further comparisons can be made among the 3,000 genomes and reference genomes of different rice types. These analyses are expected to uncover the within-species diversity and genome-level population structure of O. sativa in great detail. Thus, we hope that this data note will be the beginning of a new round of accelerated discoveries in rice science. Here, we would like to call for an international effort to analyze and mine the dataset. The expected information explosion from follow-up studies of the project will provide a foundation to revolutionize rice genetics and breeding research. Ultimately, this could lead to a more thorough understanding of the molecular, cellular and physiological machineries/networks responsible for the growth and development of rice plants and their responses to various abiotic and biotic stresses. This data note is accompanied by a 'Commentary’ article, where the intent and plans for the projected uses of the 3,000 rice genomes dataset are further expanded . Through the public release of this dataset, we encourage the global science community to analyze the data and to contribute in building a public rice genetic/genomic database and information platform that will accelerate rice breeding. The data set supporting the results of this article is available in the GigaScience GigaDB Database . Information on SNP variants will be available on analysis of the population-level genome diversity of the 3,000 rice genomes. Raw sequence data is also available from the SRA at PRJEB6180. This project was supported by grants from the Bill and Melinda Gates Foundation (GD1393) and the Chinese Ministry of Science and Technology (#2012DFB32280) to ZKL. At IRRI, support for the purification of genetic stocks and genomic DNAs was provided by the Global Rice Science Partnership (GRiSP) and for the multiplication of the genetic stocks by the Global Crop Diversity Trust. At CAAS, support for the purification of genetic stocks and genomic DNAs was provided by the CAAS Innovative team funding to ZKL. The IRRI team would like to thank B. Caspillo, J. Ramos, M. Rodriguez, J. Torres, and J. Victoria for assistance with the laboratory and field activities. ZKL, GZ, KLM, and HL designed the project; KLM and NRSH selected the IRRI materials; KLM, MEBN, SMQM, RAR, MCR, GLSC, and FCG prepared and curated the IRRI materials; ZKL, WSW, YMG, TQZ, JLX, XQZ, FZ, YLZ and JA selected and prepared the CAAS materials; MEBN, SMQM and MCR prepared the IRRI DNAs; WSW, YLZ, BYF, TQZ prepared the CAAS DNAs; WH, MY, YN, MW, YH, LB, XL, BW, JL, JX, ST and XL performed the sequencing and NGS data analyses; SS and KLM performed the phylogenetic analyses; ZKL, GZ, KLM, NNA, RPM, HL and JA wrote the manuscript. All authors have read and approved the final manuscript.